Hey everyone! We're so excited to be featuring Cosmo Cricket this week. 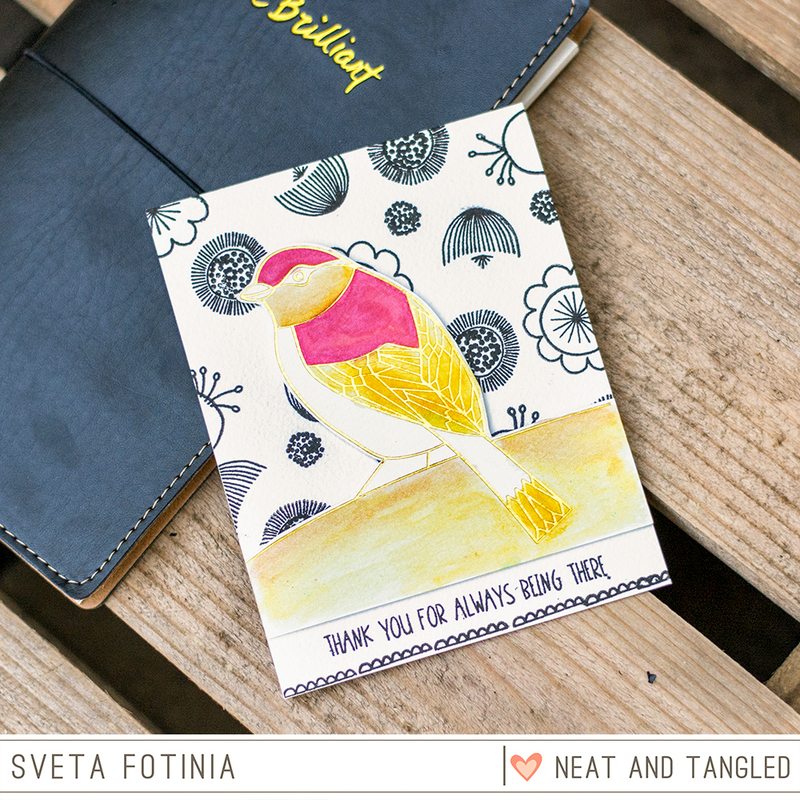 Each day this week we'll have two or three team members sharing projects featuring Cosmo Cricket and Neat & Tangled. They pair so well together and I know you're going to love what you see, our DT has had a blast playing with these fun goodies! Every good collaboration need a couple prizes, right? We've got a great little bundle of Cosmo Cricket goodies to share with one of you. Just leave a comment on each post this week and we'll pick a winner and announce them next week. Cosmo Cricket also has a prize to share, so be sure to stop by and check them out on Facebook and Instagram. Hello! I'm so exited to share my projects for our Cosmo Cricket collaboration! I must confess that I didn't know about their products and I'm really impressed with them. For the first card I picked this "love from the first sight" bird with gold foiling on watercolor paper from the WIP Book Art Deck. 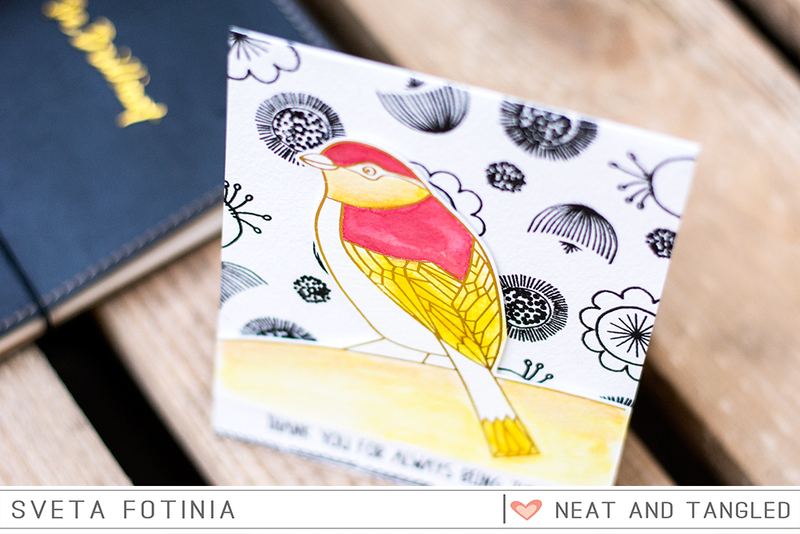 To color this bird I used Pixie Paint Ruby and Swatch Sticks. The last has a waterbrush included in the set so it's perfect for "to go" or "traveling" crafting (painting). I used the Scandinavian prints stamp set to create my background and for the sentiment. I think it coordinates with bird's lines perfectly. For my second project I played with the Just Add Watercolor Blank Tags and super amazing Pixie Paint Ruby and Pixie Paint Harbor. You should try these paints because they a pure magic! They are so easy and fun to work with and the shimmer is breathtaking. This paints gave me an opportunity to create a little cosmos on a tag. 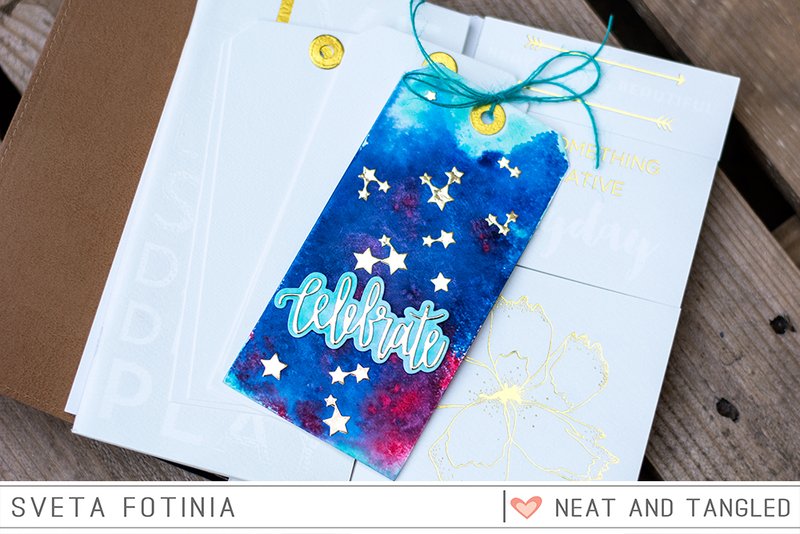 Of course cosmos needs stars and I used our latest Lucky Stars Nice and Neat die. For the sentiment I also used the super clever die set Celebrate Nice and Neat Die from our Birthday celebration release. I really enjoyed to work with these unique products and hope you have a lot of fun and are inspired by this Cosmo Cricket and Neat & Tangled collaboration week! Hey everyone! I'm really excited about this week! The Cosmo Cricket products pair so well with Neat & Tangled, and I had a great time creating today's projects. 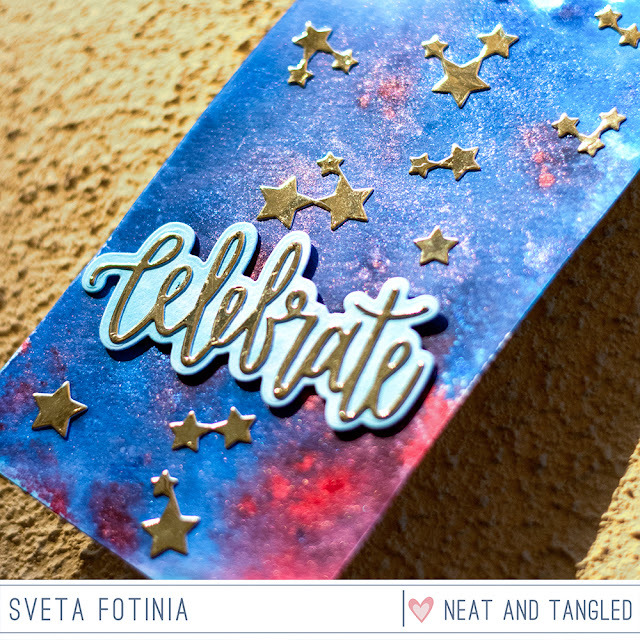 First up, a card featuring Doily Tag and our Celebrate die. The Resist Pen is used for just that, you can write on paper and then watercolor and the written portion will resist the watercolor. BUT, you can also use it as an embossing medium. Now since you write it and it almost comes out like a liquid glue, it's not an even surface, so if you are looking for that, this isn't the best application for you. Here I wanted a more textured uneven surface, so this was perfect. I added a bit of color to the center of the tag using some Swatch Sticks, and then added a bit of splatter with a Dylusions Ink Spray. For the background, I used an older Cosmo Cricket 12x12 paper with resist patterns. This particular pad isn't available any longer, but there is an 8x8 and a newer 12x12 pad. I again used swatch sticks to add a light wash to the paper and a bit of splatter. The patterned paper was adhered to a dark gray mat, and I popped the doily tag up with foam tape after adding the Celebrate die which was cut three times, once in gold mirrorboard and twice with cream cardstock. A few gold sequins finished it off. Next up a simple card using one of the designs from the WIP (Work in Progress) Art Deck. I love this little deck of designs, there are a variety of sizes and it's great for quick and easy cards. For this one I chose this sweet little tag, and then added some stamped flowers from the Paper Cut Flowers set. Rather than use regular ink, I colored the stamp with Swatch Sticks, spritzed it a couple times with water and stamped. I like the soft, loose feel you get with this technique. 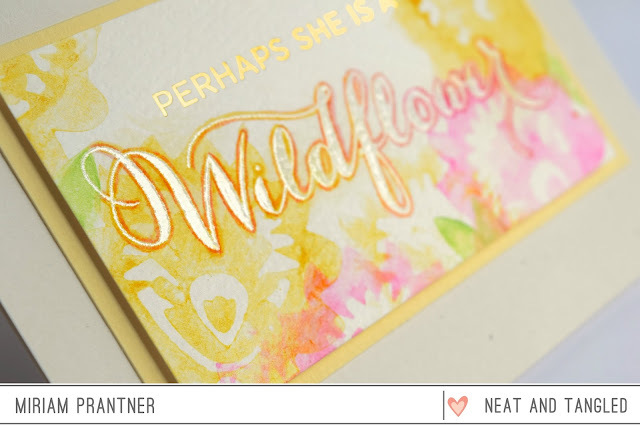 Once I was done stamping, I used the waterbrush that comes with the Swatch Sticks and added color just around the word wildflower so it would stand out. OK, that's all for me today, but be sure to leave a comment and come back each day this week, at the end of the week one lucky commenter will win a Cosmo Cricket prize pack! Beautiful cards. 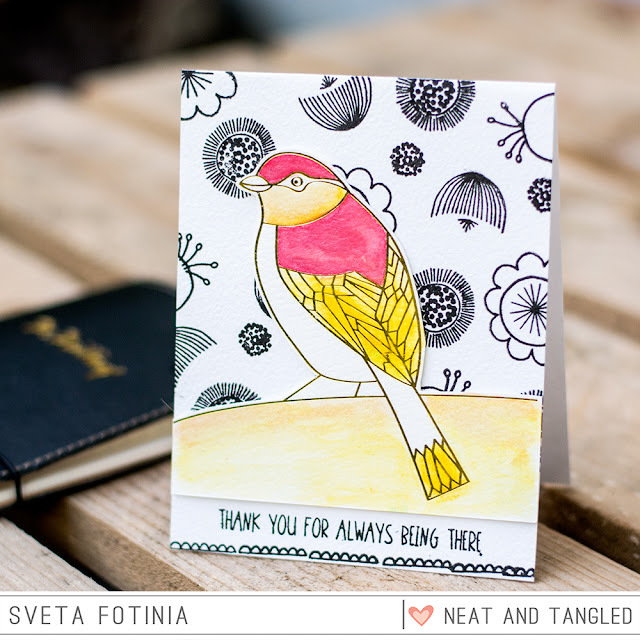 Love Sveta's bird card & it's cute design. Miriam's "celebrate" card is so unique & pretty. Simply beautiful cards by DT Members..love them..
Wow! Amazing projects!!! Can't wait to see all the beautiful creations during this week! Thank you Neat & Tangled and Cosmo Cricket! Oohhhh!! Stunning cards!!! Although I've heard of Cosmo Cricket, I didn't know what products they offered..this really makes me wanna check out! Really inspiring!!! Love the night sky on the tag. Beautiful cards. I pinned my favorites. Well done, designers. The images and gold foiling are beautiful! Lovely variety of projects with Cosmo Cricket and N&T products. Lovely projects! The Art Deck looks like such fun to use to make quick and beautiful cards! Beautiful projects! I had no idea how diverse Cosmo Cricket is. I'm especially intrigued by the Resist Pen. I love all these cards, especially the last one. I think the colors on it are fabulous! I've heard lots of good things about Cosmo Cricket but I don't have one. I see a lot of my favorite color, yellow, in a lot of the cards and that makes me very happy. 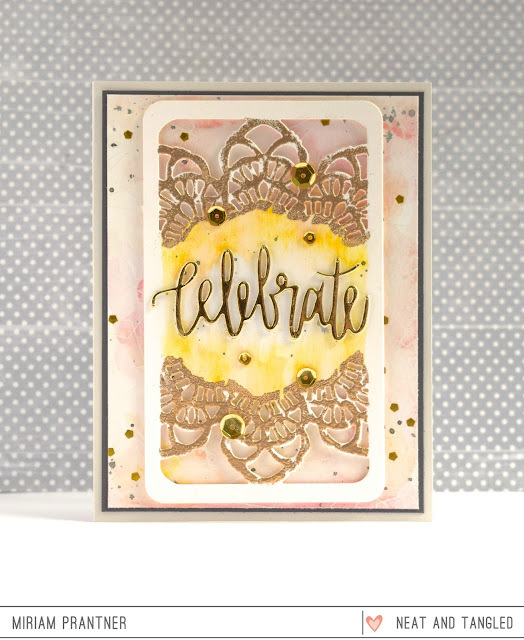 The gold on the celebrate die makes the care look so rich and expensive. That's one of the more expensive Hallmark cards, right? LOL I love each and every card and how colorful they are all are. The tag is so pretty with all the stars on them. Makes me want to go out and look up at the stars. The Wildflower card looks like it is embroidered! You look like you filled in the Wildflower with embroidery thread. I also do embroidery besides card making so that's why I say that. I love how that looks! Everyone did a nice job on all their cards. Wow-I really enjoyed all the projects today. Know I need the little star die-I have a thing for stars lately. I want to try Miriam's technique of using the swatch sticks for stamps. The effect is so lovely. Looking forward to the rest of the week and learning more about these neat new products. WOW! What an illuminating post in every way, from the gorgeous cards to the introduction of cool products from Cosmo Cricket that I didn't know about! Sveta and Miriam: thank you for the showcases today! Your creativity, combined with N&T and Cosmo Cricket, is a recipe for magic! fabulous inspiration by the team. The Wildflower card is my fav...well done! Love Miriam's celebrate tag and that resist pen looks sick cool. All Beautiful inspiration projects! The celebrate tag is my fave. Love Miriam's cards, so artsy! Thanks for the inspiration! Beautiful cards! Great collaboration projects with Cosmo Cricket! 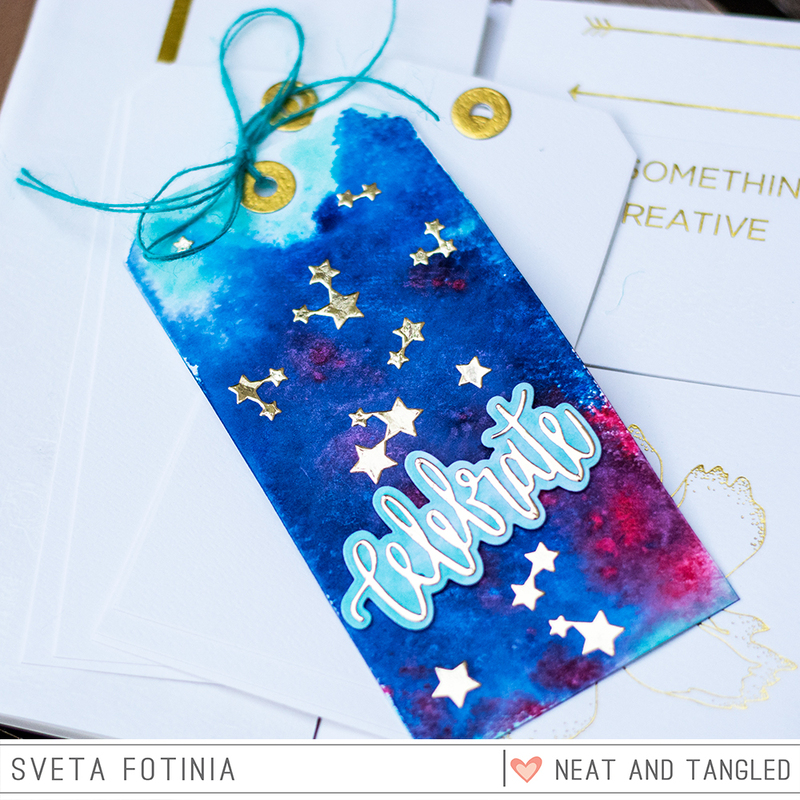 Love Sveta's night sky tag colors and details, and Miriam's gorgeous 'celebrate' card! Wow - so many beautiful projects today. Love the night sky with gold. Great projects using Neat & Tangled and Cosmo Cricket products! WOW, Sveta and Miriam, these are just beautiful! I am not familiar with Cosmo Cricket products either but I will be now! TFS! These products look like a lot of fun. 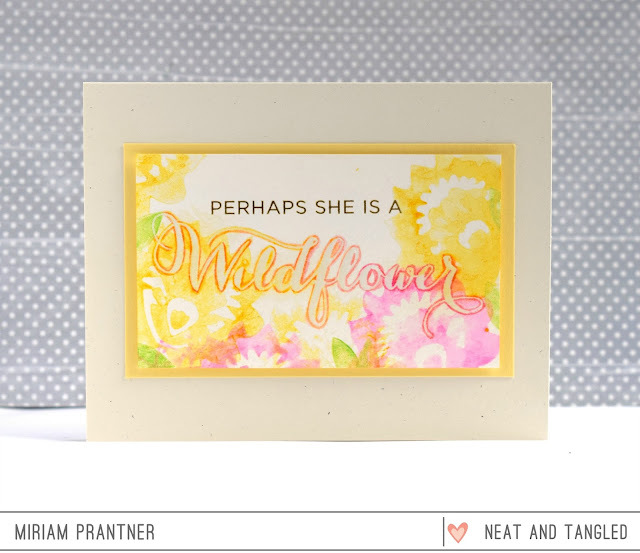 I especially like the Wildflower card. So beautiful cards!! Greate products. Love the contrast between the bird and the B&W background. WOW.. they all are gorgeous, elegant and colorful! Awesome projects - LOVE the gold on the tags - they really POP!!! Pretty cards....love the combination of colors. What beautiful creations by the DT! I'm loving everything! Love all the fabulous colour! The bird card has to be my favourite. So pretty! Wow!! Awesome projects! The Pixie Paints look like such a fun product!! Guys!!!! Thank you all for your kind comments!!! It's a joy to know you like what we do!! !